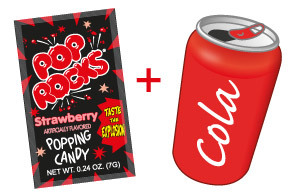 The rumor got started that POP ROCKS®, because of the carbon dioxide in the product, would fizz up and when you drink it in conjunction with a can of soda they would explode in your stomach. The rumors became so bad that the FDA even set up a hot line in Seattle (WA) for people to call to dispel the rumor and assure parents that the candy was safe for children and it would not cause the stomach to explode if mixed with carbonated drinks. POP ROCKS® are small pieces of hard candy that have been gasified with carbon dioxide under superatmospheric pressure. When these gasified sugar granules come in contact with moisture, in someone’s mouth or in water, milk, soft drinks, etc, the candy dissolves and the gas retained inside the carbon dioxide bubbles is released, causing characteristic crackling and fizzing sounds. “Carbonated Candy” was originally invented in 1956 by William A. Mitchell, a chemist at the General Foods company looking for a way to make instant carbonated soda (think Coke) by somehow trapping carbon dioxide into candy tablets. But when the instant soda experiment didn’t turn out, the formula was forgotten and put away. 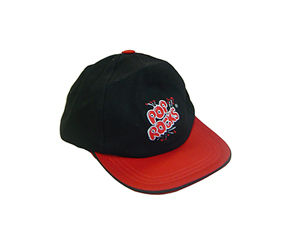 Twenty years later, another chemist came across the formula, reworked it a little, and turned it into POP ROCKS®. Though POP ROCKS® had been thoroughly tested and found innocuous, the exploding candy still startled residents when it was first released. The FDA arranged a telephone hotline to assure anxious parents that the popping candy would not cause children to choke. Mixing the candy with carbonated drinks would cause the stomach to explode, was the popular buzz. General Foods was battling “exploded kid” rumors as early as 1979, a mere four years after the product went to market. They took out full-page ads in 45 majors publications, wrote some 50,000 letters to school principals around the country, and sent the confection’s inventor on the road to explain to all that POP ROCKS® generate less gas than half a can of soda and ingesting them could induce nothing worse in the human body than a hearty, non-life-threatening belch. Despite all these measures, the rumors of the urban legend abound even to this day. But rumors die hard. POP ROCKS® were briefly discontinued in the mid-1980’s. Rising from the rumor-fanned flames just a few years later, today POP ROCKS® continues to be a national brand full of energy. 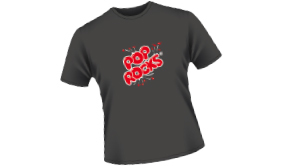 Who do I contact if I am interested in licensing the POP ROCKS® brand? How many flavors does POP ROCKS® offer? A large variety. Strawberry, Watermelon, Tropical, Blue Razz, Original Cherry, Cotton Candy, Grape and Strawberry Sugar Free are available year round. POP ROCKS® Bubble Gum and POP ROCKS® DIPS are also available in a standard way. But also look for all the new limited editions that are launched regularly: Chocolate, Pumpkin Patch Orange and Candy Cane. Our goal is to provide safe, high-quality candies for our consumers. The primary source of information about the allergen status of our products is the labelling on the packaging in which the product is sold. Consumers should always read the ingredient statement and any allergen statement before consumption to ensure a product does not contain any ingredients of concern. All Pop Rocks® items contain LACTOSE (MILK). Pop Rocks® Gum contains LACTOSE (MILK) and also SOY (in the gum base). Pop Rocks® Chocolate contains MILK, LACTOSE (MILK) and also SOY. Pop Rocks® Pumpkin Patch Orange, Green Apple & Xtreme contain Tartrazine (Yellow#5). Pop Rocks® items are free of gluten, peanuts, tree nuts, eggs, fish and shellfish.